Sheffield FC host play-off chasing Alvechurch knowing defeat could see them drop to the bottom of Division One South. Only goal-difference separates Club from bottom placed Gresley FC, who host Spalding United in 13th with just six points blanketing the bottom 10-teams. “The players have got to stand together and realise they are in a dogfight. I’ll continue to back my players as always but they were disappointing last week. We’ve got to become harder to beat and score more goals. Central defender Louis Morrison will make his debut after signing on-loan from Alfreton Town. Sheffield gave an excellent account of themselves in the reverse fixture back in November when they were unfortunate to go down 3-2. 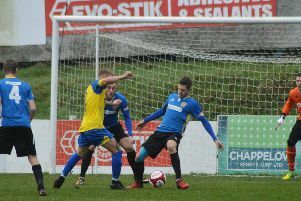 Stocksbridge Park Steels go to Carlton Town still in with a shout of reaching the play-offs despite manager Chris Hilton insisting his side are not good enough to finish in the top six. Whether that was a psychological tactic to give his side the proverbial kick-up the backside only Hilton will know. Either way it certainly had the desired effect as Steels grabbed a late winner to beat Romulus 2-1 in the last outing, a result that puts the Bracken Moor club to within six-points of the top six. Carlton - 16th in the table - but with games in hand on the teams around them, have been in good form over the past month where they have won three and drawn one of the last six outings in all competitions since a 6-2 thumping at Basford United on Boxing Day. However, Stocksbridge will be looking to further boost their play-off hopes by completing a league double following 2-1 victory at Bracken Moor in mid-November. Frickley Athletic will be expected to extend their excellent run of form when they host Market Drayton Town at Westfield Lane. Spence Fearn’s in-form side have picked up 28-points from the last 33 available including a 6-0 thrashing of Market Drayton which has rocketed them to second in the table. Shaw Lane entertain Stourbridge as they look to hang onto the coat tails of Division leaders Altrincham. The Ducks have taken eight-points from five game since the turn of the year which has seen them slip to third in the table and although seven-points off the summit Paul Quinn’s side do have two games in hand. FIXTURES: Premier Division: Barwell v Buxton, Matlock Town v Lancaster City, Stourbridge v Shaw Lane.